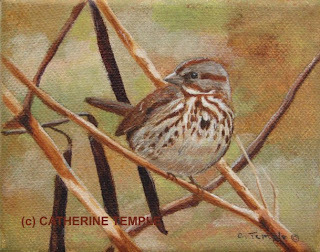 Here is another of my miniature paintings (4" x 5") featuring a song sparrow perched among early spring twigs. I spotted him as I was out on one of my morning walks. Actually, I heard him first since, as his name implies, they are quite the singers. It was an overcast, drizzly morning, but that did not damper his spirits any or his song. 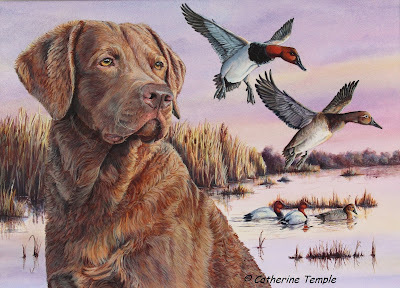 I chose to paint this piece with a very muted palette of colors that make you have to look just a bit for the bird since usually you have to do just that. They are small birds and blend into their environment very well especially on a rainy day. The best way to find them is to follow the song. So perhaps you need just a bit of spring on a rainy day. Just click on the ETSY button and follow that to my store where you will find this little songster for sale priced at just SOLD. And by the way, Happy Spring!!! "It's My Chair" takes Third!